This fun picture book for very young readers is very sweet. Minka, little Mouses sister, makes a Valentine card. She assembles the materials and puts it all together, finishing with a beautiful heart-shaped card with lace and a ribbon. Mouse watches her working, and has a happy surprise when it is revealed for whom Minka is making the card. The illustrations (done in oil?) are full of saturated colors, and the lettering of the text is artfully arranged around the objects in the pictures. 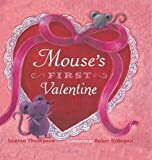 Some parents may feel that this book is pandering to the commercialism of Valentines Day, but it is worth noting that Minka makes her own card rather than purchases one, and the main message is that it is nice to make a gift for someone you love.